Target audience: Nonprofits, cause organizations, foundations, NGOs, social enterprises, businesses, educators, journalists, anyone with a Facebook page. M+R Strategic Services and the Nonprofit Technology Network last week released a report about Facebook benchmarks that seems to validate a lot of current assumptions and sheds light on previous unknowns. The report analyzed Facebook Insights from July to December 2011 of 37 very large nonprofit organizations, such as the AARP, Human Rights Coalition, and Oxfam America. The report offers some insightful benchmarks for large nonprofits: average number of Facebook fans, the reach of a Facebook update, who sees the updates, the average number of people who will be Talking About This per 1,000 Facebook fan users, and more specific benchmarked types of engagement. While it is unfortunate that smaller organizations were not included because they were under-represented among the study partners, there are some takeaways applicable to organizations of all sizes. About 10% of the nonprofits’ email list subscribers become Facebook fans. In this study, the average nonprofit had 31,473 Facebook fan page users (yes, I know, you’d probably kill for that number), representing 103 fan page users per 1,000 email subscribers. 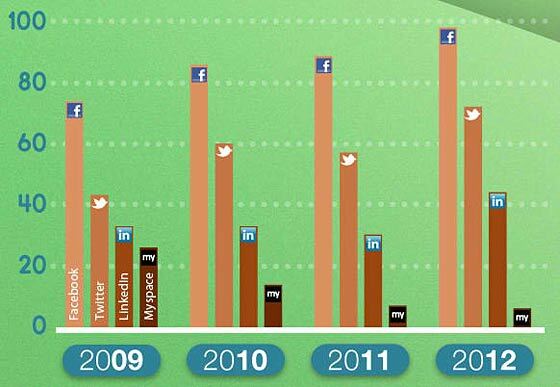 This could be a great benchmark to keep in mind for nonprofits new to Facebook, or re-engaging with Facebook. It should also be something to consider internally: Is your email list fully aware of your Facebook page, and does your Facebook page amount to about 10% of your email list number? 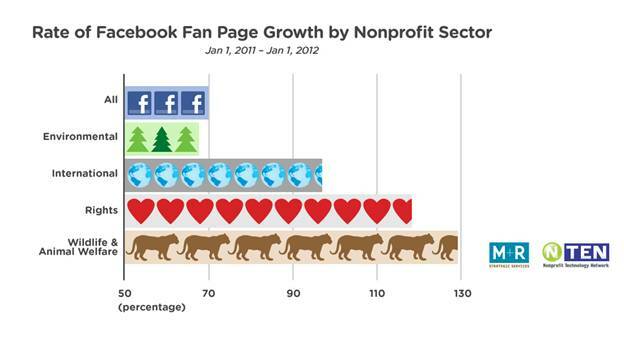 Nonprofits on Facebook grew 70% last year in terms of sheer fan Likes. Not surprisingly, wildlife and animal rights groups had a significantly higher percentage of growth. Though the report cannot begin to speculate as to the reasons for the growth, one takeaway may be that if your Facebook page did not grow significantly last year, it may be worth looking again at your Facebook posting and engagement strategy. Keep in mind that Likes does not mean that your fans are engaged or are moved to action, which should be two goals of your Facebook presence.